The heat is on, officially. WEARISOME WEATHER. Looks like a full-fledged El Niño has begun and may last, according to weather forecasters, until August 2020. The Philippine Atmospheric, Geophysical and Astronomical Services Administration on Friday declared the termination of the northeast monsoon season or “amihan” and warned that a weak but prolonged El Niño warm weather system will stay until at least August or as long as the first quarter of 2020. The phenomenon is already proving disastrous to the country, as the Department of Agriculture said earlier in the week that damage to crops had grown from P464.27 million on March 11 to P1.33 billion as of Tuesday, March 19. Analiza Solis, the state weather bureau’s Climate Information Monitoring and Prediction chief, said the El Niño will continue to be felt in the Philippines past August—not up to June as they earlier reported. At a news conference at the Science Garden in Quezon City, Solis said the phenomenon will bring about “severe meteorological impact” up to the end of April in many parts of the country. At least 61 percent of the country, including Metro Manila, is expected to experience drought, while 39 percent of the country is forecast to feel the long dry spell, she added. In a Facebook post, the Agriculture department’s DRRM Operations Center said drought had claimed 78,348 metric tons of rice and corn, over triple the 22,918 MT of rice and corn posted in the previous week. Rice took the biggest hit with production losses of P814.4 million or 41,003 MT, while corn suffered P512.3 million in losses or 37,344 MT. Drought-ridden agricultural lands also grew from 13,679 hectares to 70,353 ha, affecting 84,932 farmers and fisherfolk—or five times as many workers hit in the previous week. Northern Mindanao has been bearing the brunt of El Niño, according to the DA report. This was after PAGASA Administrator Vicente Malano declared the start of the dry season with the termination of the “amihan” monsoon. “With this development, the day-to-day weather across the country will gradually become warmer, though isolated thunderstorms are also likely to occur,” he said. According to Solis, apart from Metro Manila, areas to experience drought by the end of April are Pangasinan, Bataan, Pampanga, Tarlac, Zambales, Batangas, Cavite, Laguna, Quezon, Marinduque, Occidental Mindoro, Oriental Mindoro, Romblon, Albay, Camarines Sur, Catanduanes, Masbate and Sorsogon in Luzon. PAGASA said these areas must brace for drought until the end of May. In the Visayas, Aklan, Antique, Capiz, Siquijor, Biliran, Eastern Samar, Leyte, Northern Samar and Samar (Western Samar) will also experience drought as well as Mindanao’s Misamis Occidental and Dinagat Islands, Solis said. She added 37 percent of the country will likely experience drought and 4 percent a dry spell by end of May. 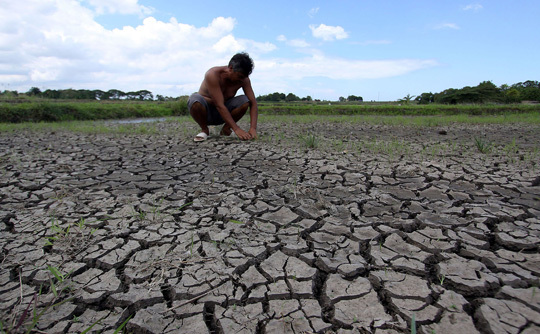 Drought will affect only 19 percent of the country—Metro Manila, Pangasinan, Bataan, Pampanga, Tarlac, Zambales, Batangas, Cavite, Laguna, Occidental Mindoro, Oriental Mindoro, and Masbate—in June, she cited. Drought will also distress Antique, Biliran, Northern Samar and Samar (Western Samar) in June, but will spare Mindanao, the weather bureau added. Most dams and lakes in April “will possibly experience way below to below normal” rainfall conditions, while generally below to near normal rainfall conditions is likely during the rest of the forecast period, Malano said. Despite the presence of El Niño, a low-pressure area outside the Philippine Area of Responsibility could enter the country and develop into a powerful typhoon with reduced amount of rainfall. El Niño, the weather bureau said, started to develop during the last quarter of 2018 and is still present in the tropical Pacific Ocean. “Both oceanic and atmospheric indicators have reached El Niño threshold levels in February. Recent conditions suggest that this phenomenon will likely continue until the April-May-June 2019 season and that varying impacts are now occurring in most areas of the country,” the PAGASA El Niño advisory No. 2 stated.